With five cases of flaming Note7s in the U.S. alone, Samsung is apparently halting production of its ostensibly safe replacement phones. Amid reports of five replacement Galaxy Note7 models catching fire in the U.S. alone, Samsung says it is “temporarily adjusting” the production schedule of its beleaguered smartphone. It’s careful wording, and it follows a report from the Yonhap News Agency that Samsung has suspended production of the phone in cooperation with safety regulators from South Korea, China, and the U.S.
Why words matter: There’s a semantic difference, albeit fine, between “adjusting” a production schedule and “halting” or “suspending” a production schedule. An adjustment suggests Samsung is just freezing the production line to investigate problems, and will return to previously scheduled programming in due time. Meanwhile, a suspension suggests a greater degree of finality. The upshot? It would appear that Samsung is backing its Note7 for the long haul—that it’s not giving up on the phone despite the phablet’s overwhelmingly bad image problems. Andrew Zuis holds up his daughter’s replacement Note7, which allegedly caught fire in Farmington, MN. On Sunday, mobile carriers stopped handing out ostensibly safe replacement Note7s to owners who purchased one of the original recalled phones. The carriers’ decision follows a spate of reports concerning replacement phones that have caught fire in the last week. Last week an alleged replacement phone caught fire on a Southwest flight, prompting an evacuation on the runway in Louisville, KY. On October 8, we learned that a Farmington, MN teenager suffered a burn when an alleged replacement Note7 went up in flames in her hand. 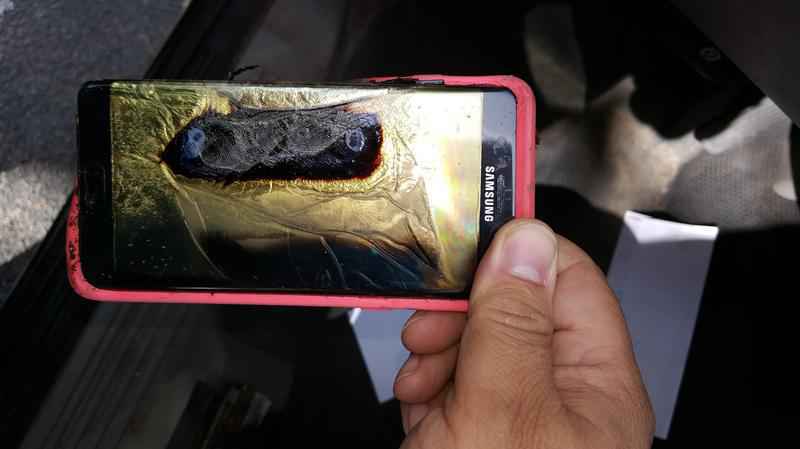 On the same day, a man in Nicholasville, KY reported that his alleged replacement Note7 caught fire on Tuesday. On Sunday, a man in Virginia contacted the Verge with photos of a Note7 that “burst into flames” on his nightstand. The same day, The Verge shared the story of a Texas man whose replacement Note7 caught fire while sitting on a table. All of the reports appear reliable, and they’re damning evidence that Samsung continues to have a serious phone problem on its hands. On September 15, Samsung recalled the original batch of Note7s in accordance with a Consumer Product Safety Commission decision. Now its replacement Note7s appear to be catching fire, begging the question, How can Samsung possibly salvage the Note7 if it needs to issue a second recall? We have asked Samsung for comment on the technical problems facing the Note7, and will publish its response once it arrives.